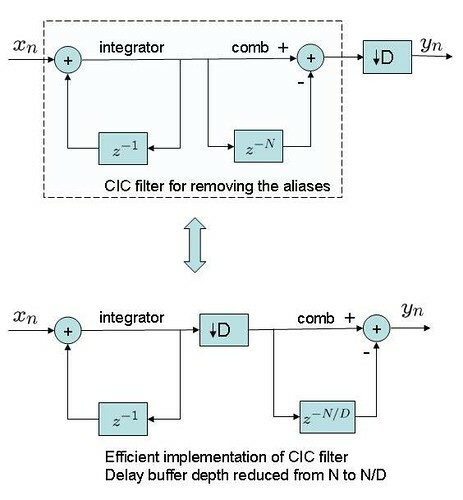 Let me briefly share my understanding on the cascaded integrator comb (CIC) filter, thanks to the nice article. For understanding the cascaded integrator comb (CIC) filter, firstly let us understand the moving average filter, which is accumulation latest samples of an input sequence . 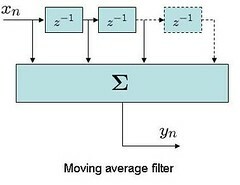 The moving average filter which is implemented as a direct form FIR type as shown above can also be implemented in a recursive form. It consists of a comb stage whose output is difference of the current sample and the sample which came prior. The difference is successively accumulated by an integrator stage. Together the circuits behave identically as the moving average filter described prior. Bit more details can be found in Sec2.5.2 Recursive and Non Recursive Realization of FIR systems in [DSP-PROAKIS]. As the system is linear, the position of the integrator and comb stage can be swapped. Now, using a small Matlab code snippet let us verify that the output from CIC realization is indeed the same as obtained from moving average filter. The recursive realization of the FIR filter as described above helps to achieve the same result with less hardware. Typically, decimation to a lower sampling rate is achieved by taking one sample out of every samples. There exists an anti-aliasing filter to remove the un-desired spectrum before decimation. 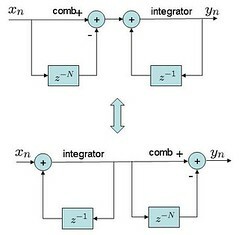 As shown above, the same output can be achieved by having the decimation stage between integrator stage and comb stage. This helps in reducing the delay buffer depth requirement of the comb section. Using a small Matlab code snippet, let us check whether both the implementations behave identically. Typically, interpolation to a higher sampling rate achieved by inserting zeros between consecutive samples followed by filtering (for removing the images). As shown above, the same result can be achieved by having the upsampling stage between comb and integrator stage. This helps in reducing the delay buffer depth requirement of the comb section. Using a small Matlab code snippet, let us check whether both the implementations behave identically. One one question: Upsampling by a factor which is achieved by repeating the sample times result in the same output as obtained by the CIC filter implementation described above (see previous post trying to describe that zero-order hold for interpolation). Considering so, do we need to have the filtering hardware when doing interpolation? I do not think so. If I have some additional thoughts, I will update. 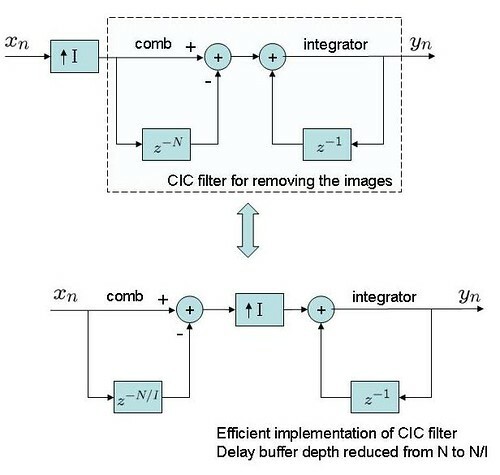 Now i understood completely about CIC filter and its advantage. How do you decide ‘delay buffer depth’?? I would like to know if there is some one who can show me an Matlab example which performs the Comb Filter Logic which is explained here in the below links. Any one logic will be enough to start with. This will help me to go forward with the filter implementation. It is very urgent for me as I have to meet my deadlines. thanking you in advance for understanding! I want to know if I want to share files in this site then how can I do that? For example when I have a problem in MATLAB coding and I want to share file to show the people how I am coding it, as some times the codes are too long to paste here then it makes simpler to share the files instead. Here I have a FIR Comb Filter *.m file but I don’t know how I can modify it to meet my requirements as explained in my previous posts. You need to just run TS.m file and you will see output of a Comb filter. I don’t if that will be helpful to both of my questions. @Prashant: Knowing the sampling frequency of your systems, one can find where the nulls of the comb are present. I would like to know if there is a possibility to speak to you about my issue? If that is possible then it will be very helpful as I am getting close to my deadlines. Kindly let me know by what means will it be possible? Apart from my previous post I have also the same Issue with a different requirement. Below are the link which shows what I am looking for. But the problem is how do I implement that? Here in this case I want to see only odd harmonics only in the output transfer function. I have never worked with ‘Comb Type FIR Filters’ so I am lost here. I will be very grateful to you if you have a solution for such problem. The Below link shows how the buffer length ‘K’, Delay element Z^-1 & transmitted frequencies (Transfer Function) vary. It will be very helpful in my project if you have any solution for such problem. So I think ‘D’ will be order of the filter, right? How can I mention the sampling freqency ‘Fs’ of this filter? Kindly guide me How I can determine these from the filter code. i want to plot the magnitude response of CIC filter.Thanks in advance.That would help me a lot. @arunraj: does this post help? @Bhavani: Hope this matlab code snippet helps. Is there a way to replace the block “arrow up, I”,with zero-hold block(which passes the value of the input signal to the output instead of inserting a zero between samples). How i can realize that in matlab? @richa: Please provide more details of the problem which you are facing. hi. i had a homework to do but i can’t do it. so please i need your help to solve it. it’s about matlab and digital signal processing. I still can not understand whether we must use digital low pass filter after interpolation. In fact , for upsampling, there is no aliasing issue at all and also the spectrum of the interpolation sequence is still periodic through low pass filter. To my understanding, after interpolation without low pass filter we can deliver the signal to DAC module directly to get the analog signal in time domain.Right ? In addition, is there any other way to understand whether we can move the Decimation from the end of the cic to the mid of the cic without the help of matlab? That is to say, could we understand this by formula? 1/ Any digital signal will have spectrum from -infinity to +infinity. So, if we do not use the low pass filter, we will be transmitting the original spectrum plus all the replicas. And this is not desirable. Yes, one can drive the output of the interpolation (inserting of zeros between samples) and pass to the DAC. However, note that most DAC’s have a zero-order hold transfer function i.e. hold on to the previous sample till the next sample has arrived. This zero-order hold is simple rectangular filter with sinc shaped frequency response. 2/ I have not tried playing with the math. However, it seems that once we write the transfer function of each stage, we should be able to get the equivalence. One question. If I have to create harmonics of a audio signal… I want make a basic integrator, that it have harmonic distorsion. Can you help? I want a filter coefficients (A and B)for a Matlab function filter(B,A,x)!!! could you please explain the frequency response code snippet given above in one of the posts. How does it differ for a decimation filter? @samanvita: Whether its interpolation or decimation filter, both are rectangular filters in time domain, which has a sinc() shaped frequency response. The rectangular filters can be equivalently implemented using an integrator arm and a comb arm . In the case of differentiation filter, we have the comb arm after the downsampling (to save the delay line depth). Thanks for looking into the paper. I just wanted to point out that “N” has a major impact on the filter. As you have noticed, Eq(1) refers to a single integrator stage and Eq(2) refers to a single comb stage. The number of stages in the integrator and the number of stages in the comb section are equal. The only difference is that the comb section runs at a lower sampling rate. Anyways, glad you were able to look into this paper. May be it’ll give you ideas for the future. In this post krishna has worked on single stage Integrator and comb. and its true that in Hogenauer’s paper – “An economical class of digital filters for decimation and interpolation” he said about multistage implementation. As we increase the number of stages the image/alias rejection will improve. Here in krishna blog N=10 only refers to the number of samples in T duration. As I understand, he is just stating there can be N integrator stages with each having unity delay. See Eq (1) and Fig (1,2). In our simple example, we are having only ONE integrator stage. Hope this explains. Thanks for the reply. I noticed that in the diagram too, which is where I got confused. The code and the diagram go together, but I am wondering whether the concept is right. Here is a excerpt from Hogenauer’s original paper on CIC filters. Note that it mentions “N” stages for both integrator and comb sections. @Rohith: Its the comb stage which has the N delay element, integrator has only one delay. I am hoping that the figure above is self explanatory. I’m not sure if I completely follow the code for the CIC filter. Does “N” refer to the number of stages? If so, then why is it that the integrator only has one stage? @Rudheesh: Thanks. You can also also look at the other posts and give your valuable feedback. Yeah, am from Kerala…. though now its Bangalore which gives me the rice and sambar. Thank you for the excellent article. You have simplified the concept in a way so that evryone can understand. By the way, are you from kerala?? @venkata : you can use the fdatool for designing both fir/iir low/high/band pass/stop filters in Matlab. type fdatool on the matlab command line to invoke the gui. % Create the window vector for the design algorithm. % Calculate the coefficients using the FIR1 function. % Set the arithmetic property. @Prashant: Thanks for the help. Hope this answers your query#2. For query#1, from a quick wiking, I found that comb generator is a source which can generate multiple harmonics of the same signal. and query#3: generating waveform which is the sum of multiple harmonics of the same sinusoidal should be reasonably trivial, no? You can look at the OFDM posts. am working on “comb generator” i know it basically under microwave product. my basic doubt is 1) what is comb generator? 2) what is the difference between comb generator and comb filter? 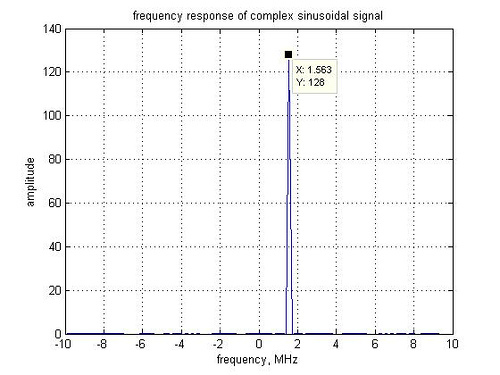 Amazing blog post about le of Cascaded Integrator Comb filter in Matlab – DSP log. I enjoy this view! As you may have observed, the CIC filter is a recursive implementation of a moving average filter (let us say of length N). Typically, when interpolation by a factor I , we insert I-1 zeros inbetween the samples and then do a filtering to remove the aliases. When doing interpolation, for efficient hardware implementation (i.e. to reduce the number of elements in the comb buffer), we can first do the comb (with N/I delay elements), insert I-1 zeros, then integrate. However, the effect is same as passing the I-1 zero inserted samples through a moving average filter of length N.
To find the frequency response, you can either use fft() of the time domain impulse response, or use the freqz() function in Matlab. Both gives identical frequency response. 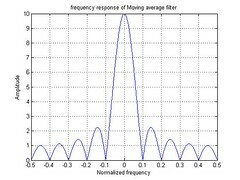 how to plot cic filter frequency response in matlab with the code mentioned above for interpolation? Yes, for notational simplicity I ignored the scaling factor 1/N. However, I do believe that you agree with the recursive implementation. Why they are the same, as a scaling factor is there, 1/N ? thanks.